DETROIT, MI (June 29, 2018) — The Metro Detroit Chevy Dealers Association (MDCD) will carry on Detroit’s century-long tradition of boat racing as the Gold Cup sponsor of the Metro Detroit Chevy Dealers Hydrofest 2018. A fleet of eight H1 Unlimited teams, along with 10 boats from the Hydroplane Racing League (HRL), will take to the Detroit River for races Saturday and Sunday, August 25 and 26. Practice runs will take place Friday, August 24, with free admission to the grandstands and cold pit. The H1 winner takes home the Gold Cup, the oldest active motorsports trophy, first contested in 1904 on the Hudson River in New York. 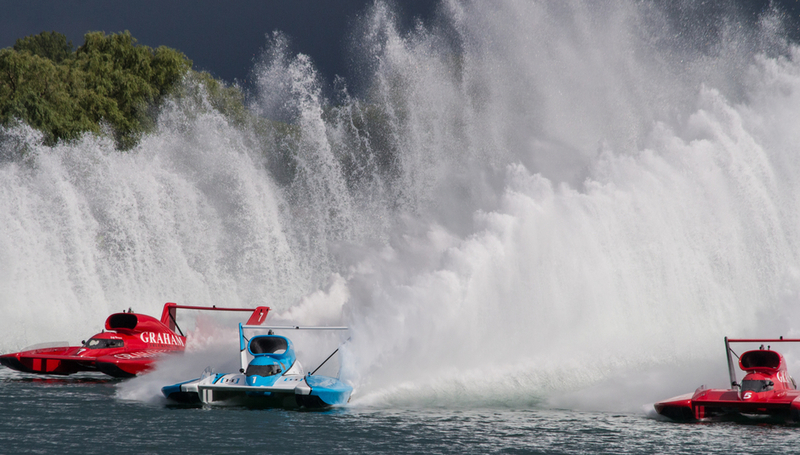 The H1 Unlimited hydroplanes are powered by turbine engines producing 3,000 horsepower, topping 200 mph and trailing a 60-foot high, 300-foot long wall of water called a “rooster tail.” The Grand Prix boats run in the HRL circuit. These boats feature supercharged, 468 cubic inch, big-block V8 Chevrolet piston engines, producing as much as 1,500 horsepower and reaching speeds of 160 mph. The first Gold Cup race on the Detroit River was held in 1916. The only sports franchise to pre-date the boat races are the Detroit Tigers, which held their first season in 1901. The Detroit race is one of six on the H1 Unlimited schedule, while the HRL will run nine events in 2018. Box office hours for the weekend are as follows: Thursday, 10 am-6 pm; Friday, 9 am-7 pm; Saturday, 7:30 am-4 pm; and Sunday, 7 am-1 pm. Race hours for the weekend are as follows: Friday, 1-7 pm, with Gold Cup qualifying rounds starting at 5 pm; Saturday, 9:30 am-4 pm; and Sunday, 10 am-6 pm. For more information about the Metro Detroit Chevy Dealers Hydrofest 2018, to purchase tickets or apply for press credentials, visit www.detroitboatraces.com or call 313-329-8047.